Young Thug rides into the release of Slime Season with a strong year under his belt. The release of Barter 6 has garnered huge attention within rap and praise from critics. 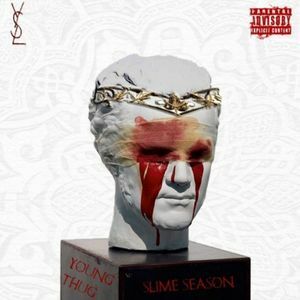 Slime Season serves as the victory lap for a year well done by Thug. There is no clear consensus on what Thug is trying to do for Slime Season, but it comes off as a project that he wanted to have fun with and do his own thing. “Take Kare” brings us the combination of Lil Wayne and Young Thug. Both rappers seem to mesh together well to their similar choppy, slow-paced flows. The composition is simplistic with the drum beat looping constantly for most of the song with a heavy bass backing the smaller tones. “Calling Your Name” is one of the tracks that just misses the mark completely. The vocals to begin the track are quite shrill and unpleasant. The backing vocals are also loud and brash, leaving room for something pleasant to be put it its place. “That’s All” is one of the songs that brings a lighter energy to the mixtape. The beat twinkles with synths and has a softer drum beat. Thug pulls away from his heavier raps and concentrates on his signature croon on the hooks. “Wood Would” is one of the better songs towards the end of the mixtape.The glitchy piano is an interesting choice to build the track upon, but while peculiar, it sounds amazing. The drums add some variance to the beat. Thug’s raps bounce along on the tracks as his raps roll rather than stand still. The song is a hidden gem, tucked away for those who chose to listen far into the album. Compared to Barter 6, Slime Season is full of Young Thug’s material. Barter 6 was full of features which took away from Young Thug’s time on the track. Even though there is no real concentration on where the tracks are going, there is an appreciation to the fact that Thug tailored each track for his liking. Even without the help of features on most of the album’s tracks, Thug still charms with his unique style of rapping.